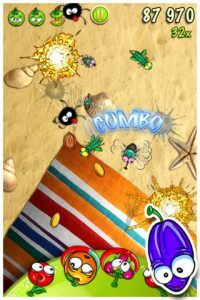 An apple a day may keep the Doctor away, but Fruit Rumble is so addicting that you might end up making an appointment with your Doc to treat the carpal tunnel you’ll develop from non-stop gaming. 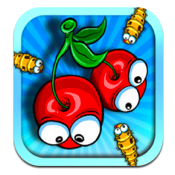 This universal game for iPhone and iPad is tons of fun, and follows the adventures of imperiled pieces of fruit as they try to combat the spoiling effects of nasty worms and bugs who want to make you rotten. But watch out for the ladybugs! They’re your pals, and if you squash them, you’re in trouble. When I first picked up this game to play it I thought it was a boring retread of the same timewaster games the App Store is already filled to the brim with. Shoot the pits, squash the bugs, look up to find you’ve reached your stop on the subway. But the more I played it, the more entrenched I got in the game, and the more angry I got when each of those little bugs got close enough to spoil my fruit. 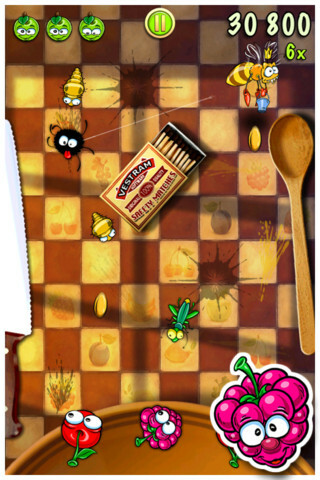 Fruit Rumble may not have appealed (or a-peeled) to me at first, but it won me over in the end. Boy, it’s turned out to be one heck of a fun game. 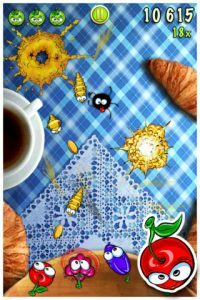 The game mechanics work great: the controls are very responsive, and there’s no frustration to be had from shooting pits at the little buggies. 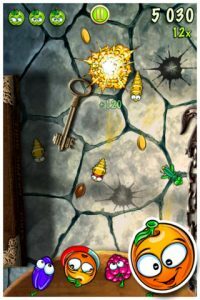 It’s got a great level of difficulty, fun music, 8 different game tables, and gameplay that really draws you in with earned bonuses and upgrades: before you know it, you’ve got a multi-fruit defense to help you defeat the hungry creepy-crawlies. For just a buck, there’s no reason you should miss out on this game. Fruit Rumble is compatible with iPhone, iPod touch, and iPad. Requires iOS 4.3 or later.